Unfortunately, car accidents happen daily. It is not uncommon to see accidents along Highway 64 or I-170. In 2008 alone, there were 143,826 traffic accidents in Missouri. That means that on average, there were about 368 accidents every day. According to the Missouri Department of Transportation, among those accidents, 1,326 were fatal, while another 40,435 were considered injury crashes. One of the top contributing circumstances identified in these crashes was inattention. In 2008, inattention accounted for 20,079 accidents, including 150 fatal crashes and 5,843 injury crashes. Almost everyone has a cell phone and drivers can frequently be seen talking and driving. A study by the National Highway Traffic Safety Administration and the Virginia Tech Transportation Institute identified cell phone use as one of the leading distractions for drivers. In Missouri, there is no law that prohibits drivers from using hand held devices, such as cell phones. The only law currently in place bans drivers under the age of 21 from texting and driving. The study discovered that being distracted for as little as three seconds can increase the risk of a car accident. According to researchers, almost 80 percent of crashes and 65 percent of near crashes that were studied, happened within three seconds of some form of distraction. Three seconds can go by quickly when a driver reaches to answer a ringing phone, turns around to reprimand fighting children or changes a music CD. Researchers also learned that if a driver reached inside the vehicle for something, it increased their risk of an accident by nine times. If you have been injured in a car accident caused by a driver who wasn't paying attention, you may be able to recover compensation. 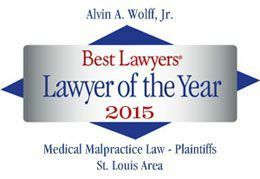 Contact an experienced St. Louis car accident attorney at the Law Offices of Alvin Wolff Jr. at (314) 241-2500 or toll free (877) 241-1020, for more information and a free case evaluation. We represent accident cases in the city of St. Louis, St. Louis County, St. Charles County, Jefferson County, Madison County Illinois, St. Clair County Illinois and Routt County Colorado.